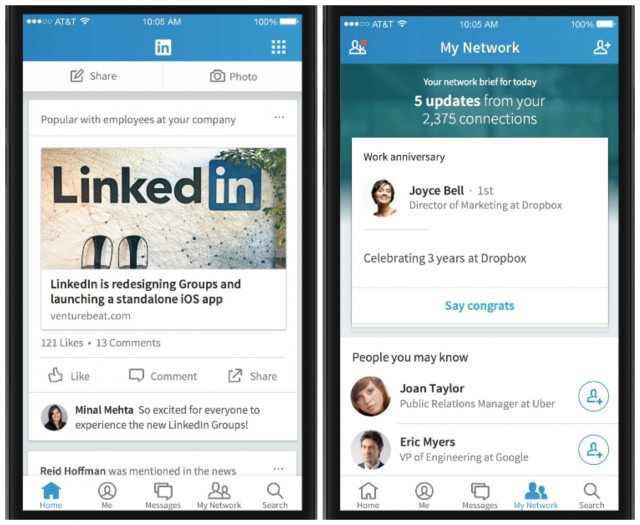 LinkedIn just gave its flagship app a major facelift. The company released a redesigned version of its main app Tuesday. The new app, which was first previewed in October, makes the app look more like Facebook and other social media apps. Like Facebook, LinkedIn’s new app is centered around a central feed, which shows you updates from people in your network and content they are sharing on LinkedIn. Similar to Facebook’s News Feed, the app filters which updates you’ll see based on what you’re most likely to be interested in — and the company says the feature will get better over time as you use the app more. The home feed is structured a lot like LinkedIn’s recently-revamped Pulse app so you may also see posts from people in your extended network and articles that are popular among people with similar jobs. “The core for the mobile product, the spine of the app, has always been this feed,” Jonathan Redfern, LinkedIn’s VP of Product, tells Mashable. Outside of the feed, there’s a “My Network” section, which serves up suggested people you may know, as well as cards with bite-sized updates about your connected friends, such as work anniversaries and new jobs. If that sounds familiar, that’s because it’s similar to LinkedIn’s Connected app, which revolves around updates like these. “The app is absolutely flavored with learnings and code from our different apps,” Redfern says, noting the parallels between both Pulse and Connected. The updated app also includes the newly-refreshed messaging features and an overhauled search feature that LinkedIn says is 300% faster than the previous app. All of the new features are available now on iOS and Android.